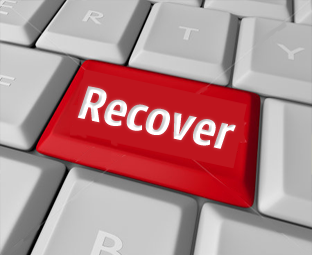 Recovering your deleted posts or pages from Blogger may appear to be a challenging task. Since, all the data is under Google’s ownership. Therefore, it’s difficult to recover your database through Hosting or any other service. Furthermore, Blogger do not have any recovering functionality it only allows to backup your Posts and Comments. Fortunately, there is a method through which you can easily get back your all deleted posts and pages in seconds. Today, in this article we will show you how to recover Your All posts or Pages in Blogger. There are numerous methods through which you can recover a post after it gets accidently removed from your site. Following are the few possible ways. Restore from Feeds, via text. Restore from Search Engine Cache, via text. Restore from Search Engine Cache, via Post ID. The most prominent way is to use Search engine cache to retrieve Post ID from the cached content. 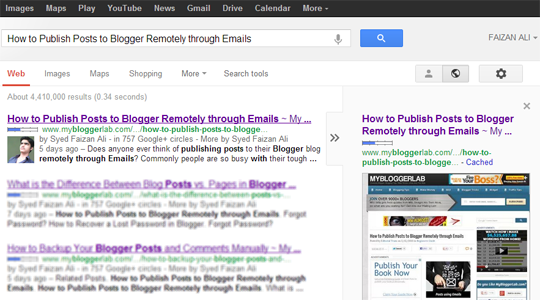 By Combining Post ID with Blog ID, you can directly get access to the Blogger’s Post Editor having all the content i.e. text and images which were deleted unintentionally. If your post is indexed in Google search engine, then go to Google.com and write the Title of your article (write the full title of your article so search engines can easily display it in the results). After finding your post in search results just hover over it and a Small arrow will appear as shown in the following screenshot. Just Press that “Arrow >>” and a new window will slide out which will display a small preview of your article. Now select “Cached” and it will take you to your post (it will display the whole content which was removed) as seen in the screenshot below. Now that you have accessed the “Cache of your article”, the next step is to find Post ID from it's source code. Just press CTRL + U and it will take you to the source code. Within the source code search for the following HTML coding (Tip: Do not search the whole code at one, just search it in a small set of keywords i.e. <div class='post hentry'>). On finding the code, there’s the unique Post ID 5177832322223143509. Now you have Post ID as well as Blog ID so you can easily recover the deleted article. 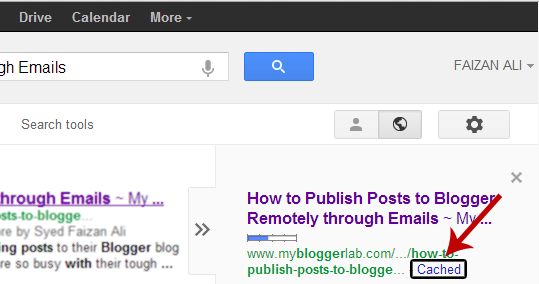 Just visit the following URL and it will take you to the Blogger editor having content i.e. Text and images which was deleted unintentionally. (Remember: Do not forget to replace the Blog ID as well as the Post ID From the following URL otherwise you would face weird errors). That's all, now you can either Publish, Save or update your article that was removed either by you or Google DMCA. 1. How to Find Blog ID? First Login into your Blogger Account, and select the blog whose ID you want to find. Select it from the dashboard, just like you do while publishing a new topic to your site. From any Page, Template, Layout you can find your blog ID number. Just take a look at your browsers Address bar. See the following screenshot below. At the end of the address bar, you will notice few numbers i.e. blogID=XXXXXX (where "X" represents the ID numbers). Note: Every site has different ID so, make sure you get the right one. 2. Does Anyone can Access My Site's Admin Panel? No one can access your site except You. If others discovered your Blog ID as Well as Post ID even than they cannot hack or edit your site until or unless their Email Address has the admin privilege. Whenever an unknown person would access your site's admin dashboard it will display an error message i.e. "Your current account (example@gmail.com) does not have access to view this page. Click here to logout and change accounts". oh great post, really very important trick, and dear why are you not replying on your forum. i have a question there, please look after that. Thanksssss Syed bhai. Really its so useful. How long Google keeps the cache version of that page which was deleted ? when you got this error. me how to resolve it. The only thing you can do here is to ask for Help on Blogger Support Forum. Go and Post a Thread entitled with "Blog was Delete". Describe your Problem, I am sure you will get back your site sooner. You are a life saver! God bless you .